The recent release by the Federal Housing Finance Agency (FHFA) shows that its measure of house prices, House Price Index – Purchase Only, rose by 5.1% on a 12-month seasonally adjusted basis in January 2015. This marks the 36th consecutive month of year-over-year growth. Over this nearly three-year period, house prices have risen by 20.1%. Similarly, the recent release from Standard and Poor’s (S&P) and Case-Shiller indicates that their measure of national house prices, the House Price Index – National, rose by 4.5% on a year-over-year seasonally adjusted basis. This is the 33rd consecutive month of year-over-year increases in the house price index. Over this period of more than two-and-a-half years, house prices have risen by 22.1%. 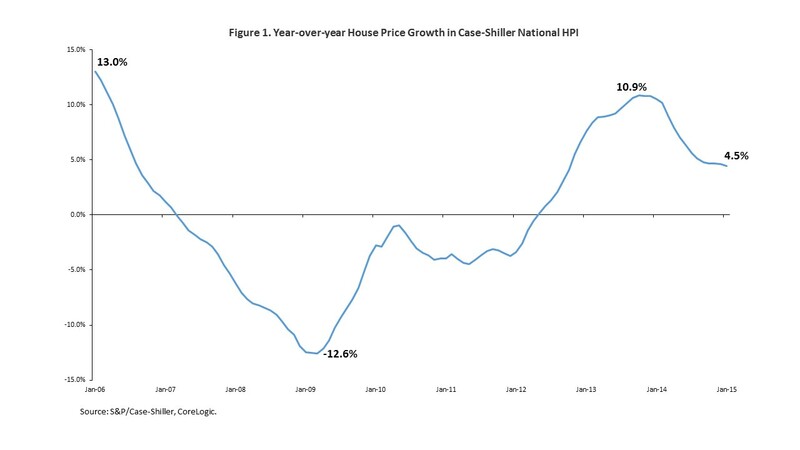 According to the S&P/Case-Shiller – National House Price Index, year-over-year house price growth was slowing in recent months. In each month between December 2011 and October 2013, the 12-month change in house prices was higher than the previous month. Year-over-year house price growth peaked at 10.9% in October 2013. However, as Figure 1 below illustrates, annual house price growth was 4.5% in January 2015. 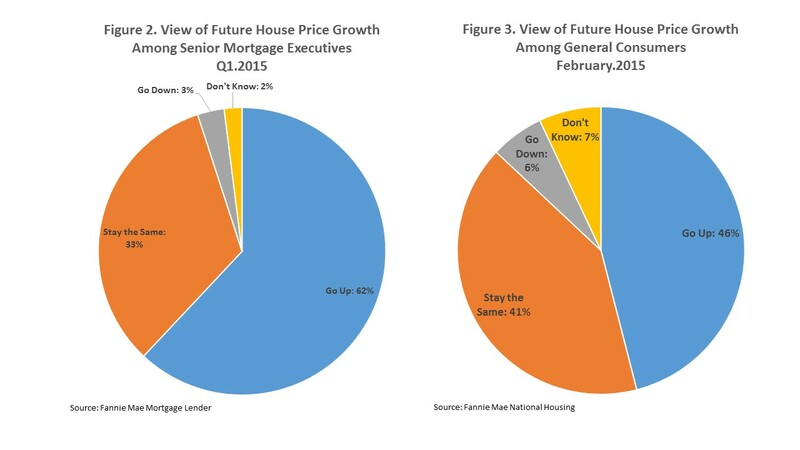 As Figure 2 below illustrates, 62% of senior mortgage executives, when polled by Fannie Mae’s Mortgage Lender Sentiment Survey, expect house prices to rise over the next 12 months. Meanwhile, one-third of senior mortgage executives expect house prices to stay the same while only 3% expect house prices to fall over the year. According to the National Housing Survey, a representative survey of the general population that is also administered by Fannie Mae, the greatest proportion of consumers, 46%, believe that house prices will rise over the year, but 41% believe that house prices will remain the same, 8 percentage points higher than the share of senior mortgage executives that express the same view. Meanwhile, only 6% of consumers believe that house prices will fall. For full histories of the composites and 20 markets included in the Case-Shiller composites, click here cs. For full histories of the FHFA US and 9 Census divisions, click here fhfa.